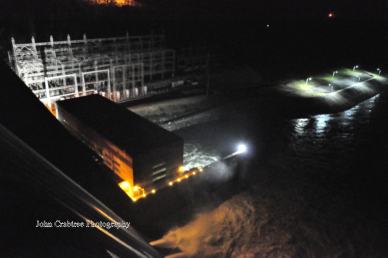 Here are few night shots of Norris Dam spilling. These were taken in March 2011. I'm going to post more photos after my husband takes his off the camera. When you see the water spill you can better appreciate the TVA dams along the river. 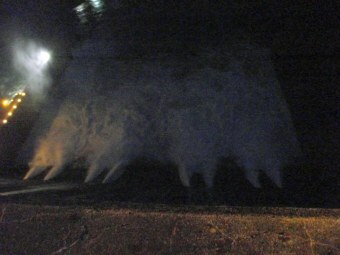 The force behind the dam comes out in a powerful rush. According to the website for the Tennessee Valley Authority, Norris Dam will be spilling "until further notice". They will post online when the dam goes back to normal. 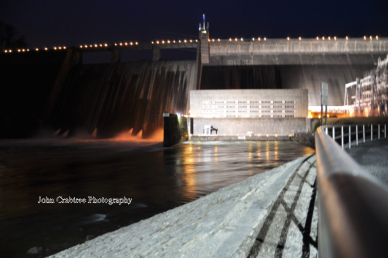 Spilling at Norris Dam isn't something that happens every day or even every year. The last spill was about a year or two ago. Before that, the dam spilled a little when in 2003. I hope you enjoy these shots. If the spill continues, I'll go back in a couple of days to take more pictures.